So, your Dad—voiced by the always fatherly Liam Neeson—goes missing and the catalyst for your adventure is introduced. You set out searching desperate for answers – or maybe not desperate at all, this is very much a sandbox after all. Motives aside, it's inevitable that you'll eventually set forward into the world of Fallout. It's a barren, bare and broken world on the surface – but it's also strangely beautiful too, influenced by a 1950s view of the future despite the contemporary pessimism. Or, to be put it another way; yes there is background radiation and zombies, but there are big laser guns and impossibly complex computers that run off cassette tapes too! “We're not really big fans of the whole winking at the camera thing, to be honest. There's some humour in Fallout 3, but not like in Fallout 2. We looked to Fallout 1 more than anything else,” said Pete as he showed us how Dogmeat, an optional canine companion, could be told to go fetch medicine for the player. As Pete pushed further on into the game, showing us some more of the now-ruined sights that Washington DC had to offer, that much became rather clear. 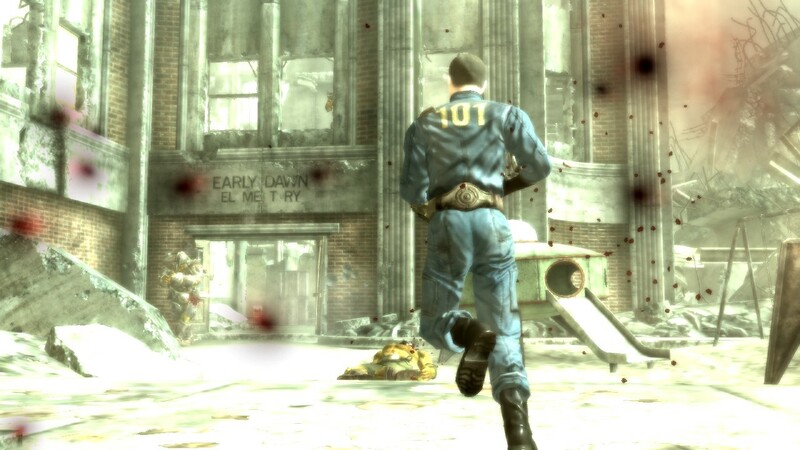 Fallout 3 is, like the first game, a post-apocalyptic adventure. It isn't a post-apocalyptic musical comedy and if you're looking for a game with that 1950s comedy feel then Serious Sam 2 may be more up your street. Here all we have is The Inkspots providing the soundtrack and buckets full of deadpan and gore. Pushing back to the original, first Fallout is undeniably what makes Fallout 3 feel so exciting because, while Fallout 2’s repeated breaking of the fourth wall and constant Mad Max references made it an arguably more fun game to play, it’s Fallout 1 that started things off. It’s only right that Bethesda should take things back to the roots. And take things back it certainly has, for much of what made the first games has been kept over. This time though we’re not talking about the tone of the game, the narrator or the soundtracks. This time we’re talking about the very building blocks – the foundation on which everything else is built on. Things like the S.P.E.C.I.A.L. stats system originally invented by Interplay. S.P.E.C.I.A.L. is the skeleton on which Fallout is built on; a system of statistics which govern all the players’ attributes and abilities. It stands for Strength, Perception, Endurance, Charisma, Intelligence, Agility and Luck and by upgrading or degrading each stat players can create an alter-ego that is truly detailed. One of the classic mistakes that new Fallout players would make is to think that it was just like in Dungeons and Dragons where it only affected player actions – everyone would turn down Intelligence and beef up Strength. The unwitting result of this tinkering would then be a character so stupid that he could not make himself understood, would struggle to get new quests and have constant setbacks on the route to victory. He’d hit like a sledgehammer dropped from a height though. How much of this that Bethesda has really taken on board was something we didn’t really get to see and, because the game is still in alpha and filled with placeholder dialogue, Pete was understandably wary of showing us much of the game’s dialogues. What we can say though is that it has a definite impact on other areas of the game, such as combat and puzzle solving. While we will discuss combat in a little while, it’s the puzzle solving side of things that really seemed interesting and Bethesda has made the controversial choice of using a mini-game to represent players hacking computers – something that was arguably a weak spot of last year’s darling, BioShock. Here though, hacking is more sensibly handled. It’s also just a tad more realistic and theme-fitting. With a high enough Science skill, players can attempt to hack computers they find on the way, which is done by uncovering the password from within a BIOS dump file. Opening up these files reveals a screen filled with garbled information, including possible candidates for the password. It’s up to the player to choose the right one from the list, with higher skills giving more guesses and the player’s PipBoy companion provides feedback to help narrow down the search – telling you what letter the password ends in for example. Ok, so it sounds a little rudimentary and will no doubt get dull after a while, but like in BioShock hacking is never mandatory and players always have another option. Unlike Oblivion it’s also possible to crash a system permanently, making the stakes much higher.